Now that HMV has gone into administration, their gift vouchers are effectively worthless. When you buy a gift voucher, you’re effectively extending a loan to the company – and if you’re buying the vouchers at face value, you’re giving them an interest free loan! You want to reduce the chances of the company going broke without them giving you the goods – plus you want to reduce the amount of time they have your cash: you want your money in a savings account earning interest. Additionally, check the terms of your gift vouchers – you might find that they’re only valid for a certain amount of time: you’ll lose all your money if you don’t spend it before the expiry date. Other cards have an “inactivity fee”, which is charged monthly if you don’t use your card for a certain period. There’s really no point in paying face value for your gift vouchers – effectively, you’re giving the company an interest free loan. 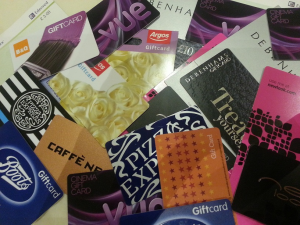 Check your company to see if they do discounts on gift cards and vouchers – you might be surprised to find that you can get a discount on your weekly shop just by buying the vouchers, then paying for your supermarket shopping using your gift card.